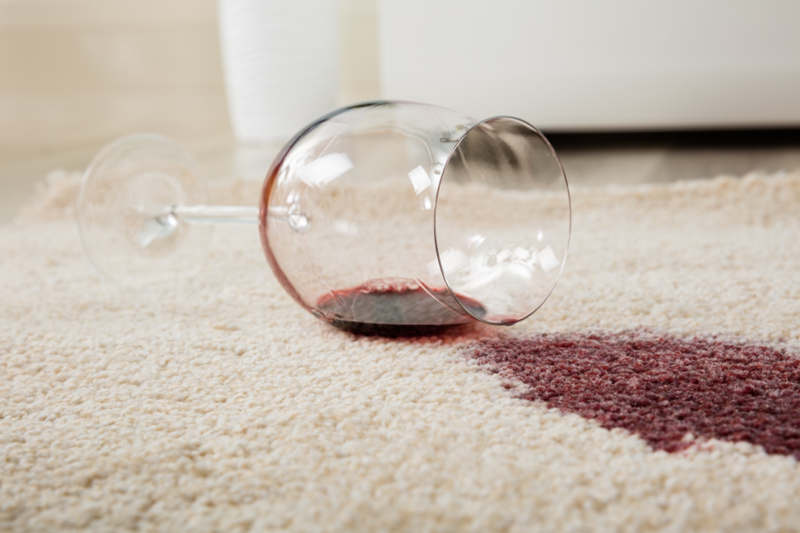 Red wine has particular properties that make it one of the most dangerous stains if not dealt with immediately and properly. The first step is to blot the stain right away, do NOT rub! This will simply smear the stain all over the place and deeper into the carpet fibers. Use a clean white cloth and alternate the parts of the cloth you use to always blot on a fresh spot. Add a little water to the stain and continue blotting to dilute the wine. After you’ve removed as much as you can with the blotting method, make a baking soda paste with 3 parts baking soda and 1 part water to place directly on the stain. Let this paste dry and sit on the stain overnight. Vacuum up the paste in the morning. If any stain remains, apply a carpet stain remover according to the product instructions. Other forms of alcohol still leave their own unique stains. If you act fast, you can more than likely minimize the stain. Prepare a solution of a mild detergent, such as a dishwashing liquid, and warm water. Use a clean cloth or paper towel and dip it into the solution. Blot the affected area of the carpet and avoid rubbing! Rubbing always leads to spreading the stain and embedding it deeper into the carpet. Allow the cloth to soak up the alcohol. After you’ve soaked up as much as you can, mix one cup white vinegar and two cups warm water. Use a spray bottle instead this time and spray the stain with this mixture. Continue to blot with another clean cloth. The white vinegar acts as a neutralizer to the alcohol stain and the odor as well. Apply a third blotting with cold water. Continue to absorb the liquid with clean, white towels. Allow the area to dry thoroughly and then go over with a vacuum cleaner. You’ll get through this! Time if always of the essence when it comes to carpet stains, so act quickly and you can save the carpets. If you don’t notice the stain until the next morning, however, you may need to call in the professionals to get it out. ServiceMaster Cleaning & Restoration Services offers expert carpet cleaning services all across Central New Jersey in Hunterdon, Middlesex, Mercer, and Somerset County. Call us today and we can get your carpets back to their former glory!